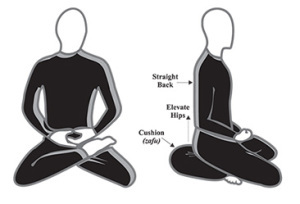 There are various ways of sitting: full lotus (legs crossed, both feet on the opposite thigh), half lotus (just one foot on the opposite thigh), modified half lotus (recommended—one foot resting across the opposite calf), kneeling, or sitting on a chair. Regardless of the pose one adopts, the same guidelines apply: knees below the hips, pelvis tilted forward, shoulders slightly back, back straight. We keep the eyes gently open, with the gaze at a natural angle downward. We inhale and exhale through the nose, with the breath moving in the abdomen (as opposed to the chest or with a rising and falling in the shoulders). Hands are held against the body, just below the belly button: right hand underneath, palm up; left hand resting on top, with thumbtips barely touching. Traditional protocol is to bow once in the direction of one's cushion, turn clockwise, and bow toward the group. This is repeated when sitting is finished. For classic zazen instructions by Dogen, the founder of the Soto school in Japan, click here.